Late in 2015, the Scioto Mile opened and created 33 new acres of parkland in downtown Columbus. The project, a massive work of environmental rehabilitation, removed lowhead dams from the Scioto River and narrowed the course of the river back to its more natural state. With miles of multi-use trails stretching from Bicentennial Plaza in the south to North Bank Park in the North, this is a great spot to take a stroll and enjoy both the city and nature. 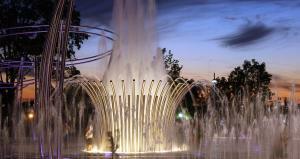 Bicentennial Park hosts free concerts on summer weekends, and a huge set of fountains create a fun environment for kids to play in during the daylight hours. Changing facilities are restrooms are available. By night, sip a local cocktail or grab a burger at Milestone 229 and watch the fountain displays change through the evening. A trail leading south from Bicentennial Plaza leads you to the Scioto Audubon Metropark, an important birding area with a nature center, the largest free climbing wall in the nation, and lots of natural areas to explore. COSI Hands on Science Museum flanks the park to the west, and artsy Franklinton lies just beyond that. A series of human-like deer statuary make excellent photo-ops for brilliant skyline photos. 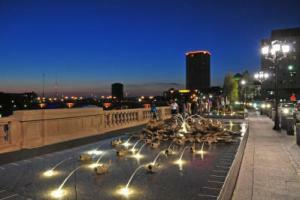 Continuing north, the trails along the east side of the river leads through bronze fish fountains and a cluster of whimsical statues to North Bank Park, where picnic tables, interactive fountains and another iconic skyline view can be found. Further north along both banks of the river, paved paths direct you toward the confluence of the Scioto and Olentangy Rivers and connect you to the Scioto Trail and the 13-mile Olentangy Trail. 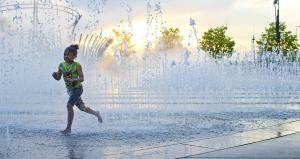 Fountains Make Summer Fun on the Scioto Mile!